Royal de Luxe's Giant Spectacular says goodbye to the UK for the final time..
A decade after it was delegated the title of 'Capital of Culture', Liverpool was once again the host of Royal de Luxe's Giant Spectacular street theatre show. The show took four giants around the city over the four days for the third time and final time. Royal de Luxe, a French marionette street theatre, has hosted the show since 1993, performing it 44 times in 12 different countries worldwide. Calling it the company's second home, Theatre Director Jean-Luc Courcoult announced that Liverpool would once again host the Giant Spectacular show through 4th October to 7th October, however it would be the final ever showing of The Giants. The Giants first visited Liverpool in 2012 for the 'Giant Spectacular: Sea Odyssey' show, a centenary performance of the sinking of the Titanic. It is estimated that 800,000 people watched the emergence of The Big Giant from Salthouse Dock before beginning his journey across the city in order to find the Little Girl Giant and her dog Xolo. Liverpool's centenary commemorations of World War I in 2014 saw The Giants return for the 'Giant Spectacular: Memories of August 1914' show. This performance saw the introduction of Grandmother Giant who was initially laid in St Georges Hall on a wooden bed before touring the city in her massive wheelchair. Around 1 million Liverpudlians, and tourists alike, filled the streets for this special commemoration performance. Region of Liverpool officials predict that over 1.3 million people watched this year's show, which saw a return of The Big Giant and Xolo and introduction of the Little Boy Giant, as well as a surprise appearance by the Little Girl Giant who was not announced by the theatre company to the run up to the performance. 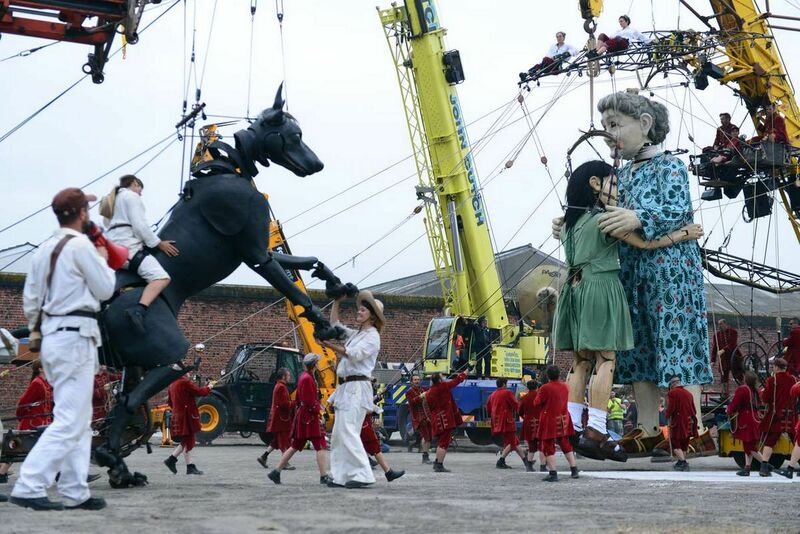 As the finale of this year's performance approached, the giants split off with the Little Boy Giant travelling to the Wirral,with the rest of the giants travelling towards the infamous Liver Building on the Pier Head for an emotional goodbye. As the giants on the Pier Head were hoisted onto their final transportation out of the city, Jean-Luc Courcoult ended with a monologue saying "It was only a story about giants who were passing brought Liverpool to carry the crowds dreams above the tides. Have you heard of or seen the Giant Spectacular before? What do you think of marionette street shows? Let us know in the comments below! Great article. Went to see the giant this weekend and they were amazing! Gutted that this was the first year I had ever heard of them and the last year they are coming!